You are here: Home / AidPod / A mini AidPod anyone? I had a great meeting yesterday with Chris Griffin at the PI Global offices in London talking about the packaging aspects of the trial. 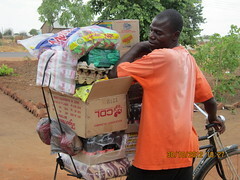 I was also able to loan him the various bottles and a crate, on loan to me from Zambian Breweries. These will obviously be crucial in defining the cross-section of the AidPod. We then went on to talk about the length of the AidPod. 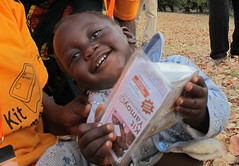 A tension has been emerging with this aspect of the AidPod over the last few months. 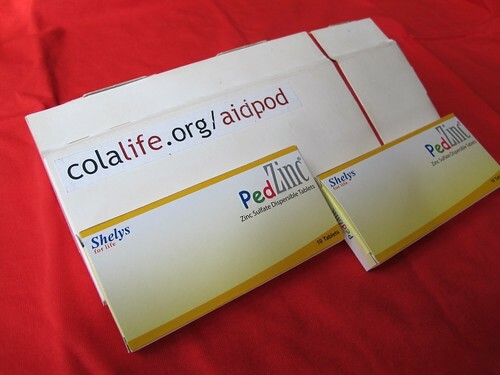 We had originally envisaged that the AidPod would be the full length of the width of the crate ie about 225mm long. This would be big enough to carry the components to treat at least two episodes of diarrhoea: four sachets of ORS, two courses of Zinc supplements and two 25g bars of soap. This thinking was based on research that showed that the biggest indicator of whether a child gets ORS is whether or not the mother, or care-giver, had ORS available in the home at the time of the attack. However, this makes the ADK (Anti-Diarrhoea Kit) twice as expensive as it needs to be and goes against the guidelines laid down by the late, great C. K. Prahalad* and others who say that when creating products for consumers earning $1-2 dollars a day, price, a low price, is absolutely crucial. These markets are completely different from more developed markets. In developed markets the starting point when pricing a product is your costs, then you add your margin to arrive at the sale price. In poor markets you need to turn this model on its head. You start from the amount people are able/willing to pay (the price) and then work backwards and design the product with a low enough cost to meet the need and enable a profit margin to be made. On balance, we have concluded (I think) that we need to take the latter approach and so the ADK will have to be as cheap as possible to produce which points to a mini, or half-length ADK. This has the added benefit that we can get 10, not 5, ADKs in each crate. But what about the research that indicates that ideally you need ORS and Zinc in the home to maximise the likelihood of treatment? Well, what we are banking on is that having ADKs available in the local retail kiosk is nearly as good as having one in the home. The trial will indicate whether or not we are right. What is helpful is that, coincidentally, the PedZinc component of the ADK comes in a box which is fully compatible with half-length, mini AidPod – see the image above.